"Kitten Cannon" by Dan Fleming. Take screenshots with the TRIANGLE button - saved in "Kitten Cannon/Screenshots/'. Highscores are now automatically saved in the Screenshots folder. Please redownload if you have a version released before 8 AM on this boards time. (just replace the eboot and add a screenshots folder if you dont want to have the longer transfer time). rightful authors of those get credit as well. Everything uncredited so far was done by me (SG57). Source is available upon request (OO C++). I updated hte info, basically I added screenshots. Press TRIANGLE at any time to take a screenshot, stored in "Kitten Cannon/Screenshots" folder. Highscores are now automatically saved as well, in the Screenshots folder. Haha nice entry. Not much of a game but at least it's amusing. I like the splash screen effect and the virtual violence. It works on my fat PSP with 3.80 M33-5. 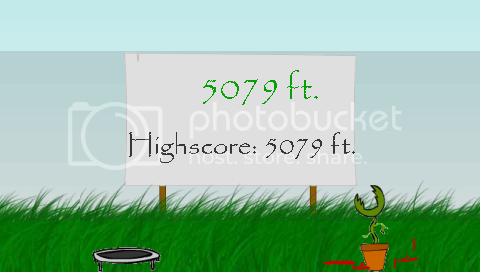 So far my high score is 3151 ft. I like the choice of music but it quickly gets repetitive. If you have any recommendations for a good ambient background music, lemme know. check it out for more options! I vote for this game! LOL, I prefer Dogs, but I don't hate Kitties, lol, why not babies? Babies would be PERFECT to shoot out of a cannon. I've yet to get past my score still - it's a conspiracy!